Edgar Degas (1834–1917), In Front of the Mirror (1889), pastel on paper, dimensions not known, Hamburger Kunsthalle, Hamburg, Germany. Image by anagoria, via Wikimedia Commons. More than half of Edgar Degas’ total output shows dancers or scenes of ballet, of which almost all feature exclusively women and girl dancers. Of the remainder of his works, a large proportion primarily or exclusively depict women. Thus the great majority of Degas’ drawings, paintings, and prints are of and about women. This article follows one theme among these: in his campaign to depict ‘modern life’, which he started in succession to his early history paintings, how did he portray ‘the modern woman’? 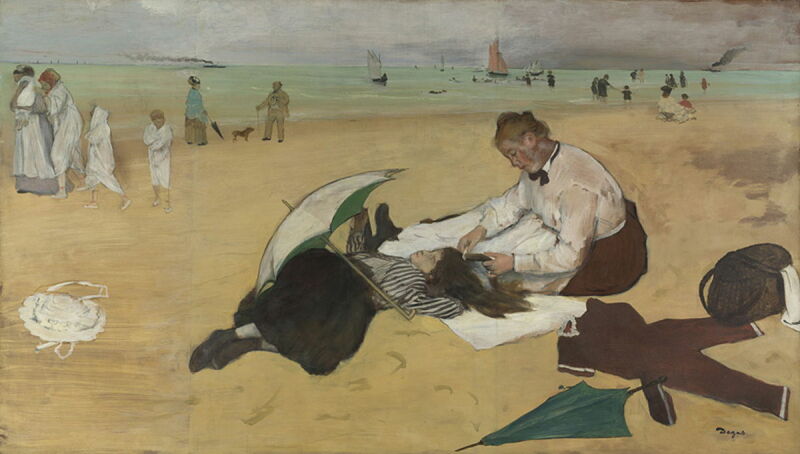 Edgar Degas (1834–1917), Beach Scene (c 1869-70), peinture à l’essence on paper mounted on canvas, 47.5 × 82.9 cm, The National Gallery (Sir Hugh Lane Bequest, 1917), London. Courtesy of and © The National Gallery, London. One of Degas’ earliest paintings of a girl and a woman, once he had started to paint ‘modern life’, is his Beach Scene from about 1869-70. It shows in the foreground a girl idly playing with a parasol, as she lounges on the beach. Combing the girl’s hair with great care is a woman, who from her dress is most probably a nanny or governess. Drying on the sand beside them is the girl’s bathing costume. This shows an interesting relationship, in which an older woman is so devoted to the care of a young girl – that of a surrogate mother, paid (usually very little) for her services. Edgar Degas (1834–1917), Woman Ironing (c 1869), oil on canvas, 92.5 × 73.5 cm, Neue Pinakothek, Munich, Germany. Wikimedia Commons. At about the same time, Degas started to paint a series of works showing laundresses, a subject which I have examined in another article. Woman Ironing (c 1869) shows one of the army of women engaged or enslaved in this occupation in Paris at the time. The woman is young, yet stands like an automaton, staring emotionlessly at the viewer. Her right hand moves an iron (not one of today’s convenient electrically-heated models) over an expanse of white linen in front of her. Her left arm hangs limply at her side, and her eyes are puffy from lack of sleep. She is surrounded by pieces of her work, which hang around her. Edgar Degas (1834–1917), Portrait of Henri Valpinçon as an Infant with His Governess (1870), oil on panel, 30 × 40 cm, Private collection. Wikimedia Commons. 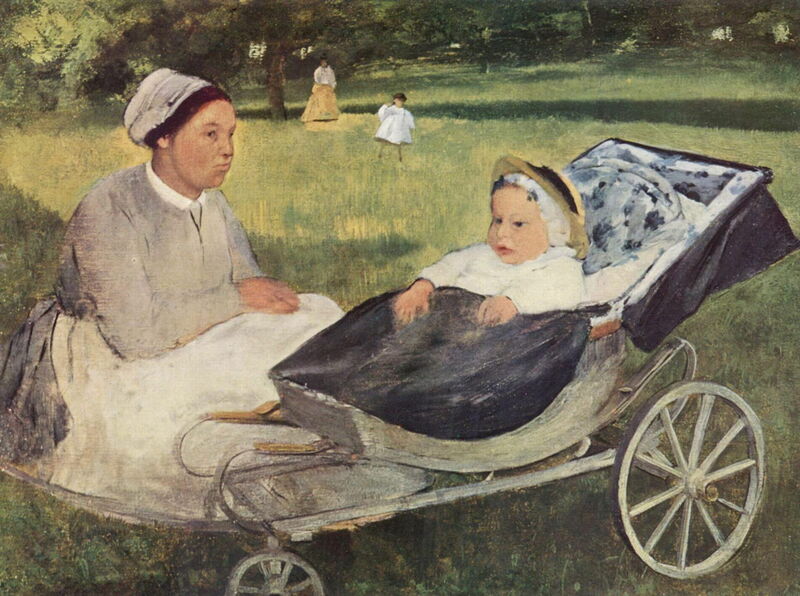 In his Portrait of Henri Valpinçon as an Infant with His Governess (1870), Degas shows another nanny or governess, whose facial expression tells a story. Here they are, taking the sun in a park, a mother and child playing happily behind them. Yet the governess looks thoroughly fed up. Edgar Degas (1834–1917), In a Café, or L’Absinthe (1873), oil on canvas, 92 × 68.5 cm, Musée d’Orsay, Paris. Wikimedia Commons. 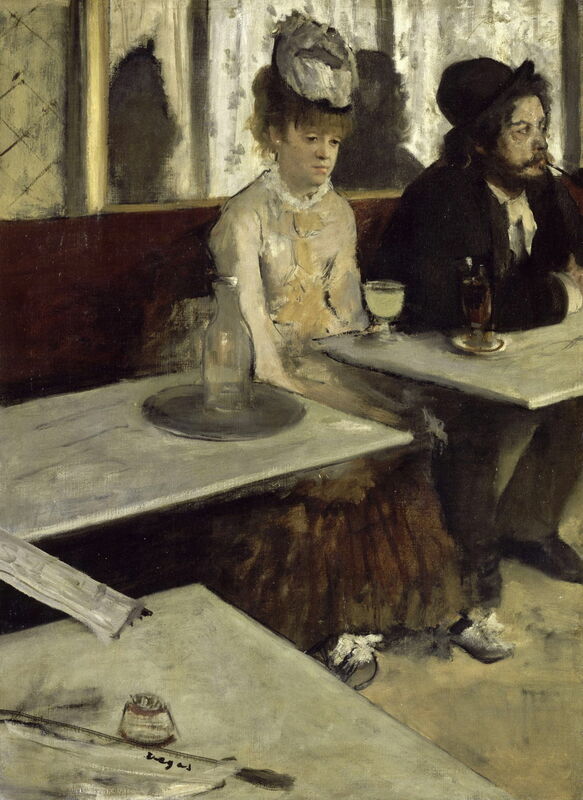 The famous painting sometimes known as In a Café, but more commonly by a translation of its alternate title of L’Absinthe (1873), presents an even bleaker view of the life and prospects of a ‘modern woman’. Set in a Paris café, a woman and man sit beside one another at a table. She is dressed in cheap gaudy clothes, he in the rough old clothes of someone well down at heel. She stares emptily at the ground, with a sad and wistful expression. In front of her are the signs of a life in steep decline: a carafe of water, and a large glass containing the distinctive cloudy yellow mixture of absinthe and water. In those days, absinthe was a toxin of no return. Its added alkaloids enhanced addictive properties beyond those of other alcoholic drinks, and damaged the brain. The woman knows that her days are numbered, and has seen others drink themselves to death before. Hilaire-Germain-Edgar Degas (1834–1917), Women Combing Their Hair (c 1875-6), oil on paper mounted on canvas, 32.4 x 46 cm, The Phillips Collection, Washington, DC. Wikimedia Commons. 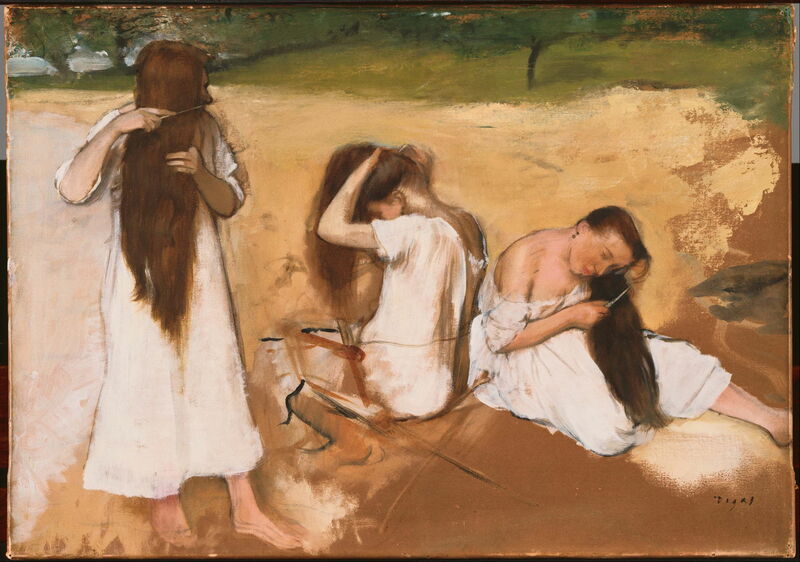 The theme of brushing and combing hair persists across many of Degas’ works, including Women Combing Their Hair painted in about 1875-6. Here three women or girls are seen from different angles – another example of the artist’s fascination with multiple images. The face of only one of them is visible. 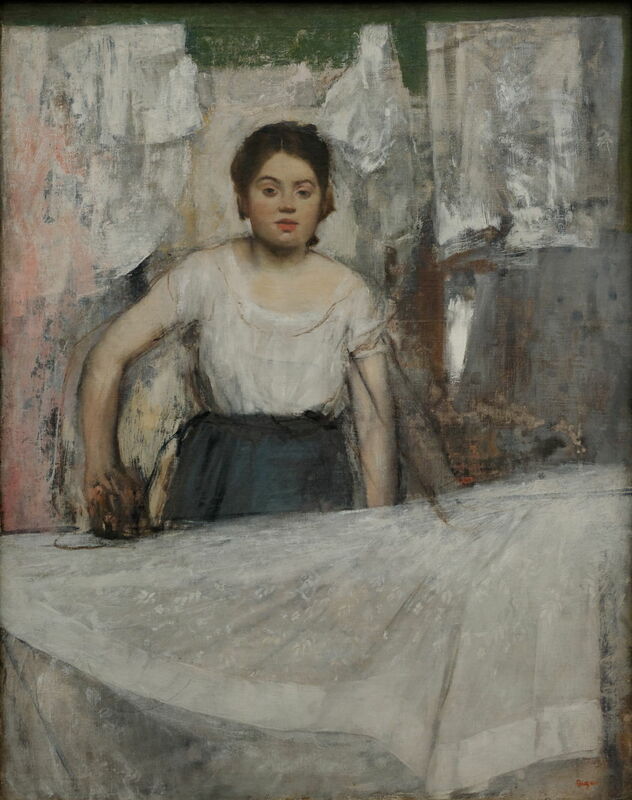 Edgar Degas (1834–1917), Woman Ironing (c 1876-87), oil on canvas, 81.3 x 66 cm, National Gallery of Art, Washington, DC. Wikimedia Commons. 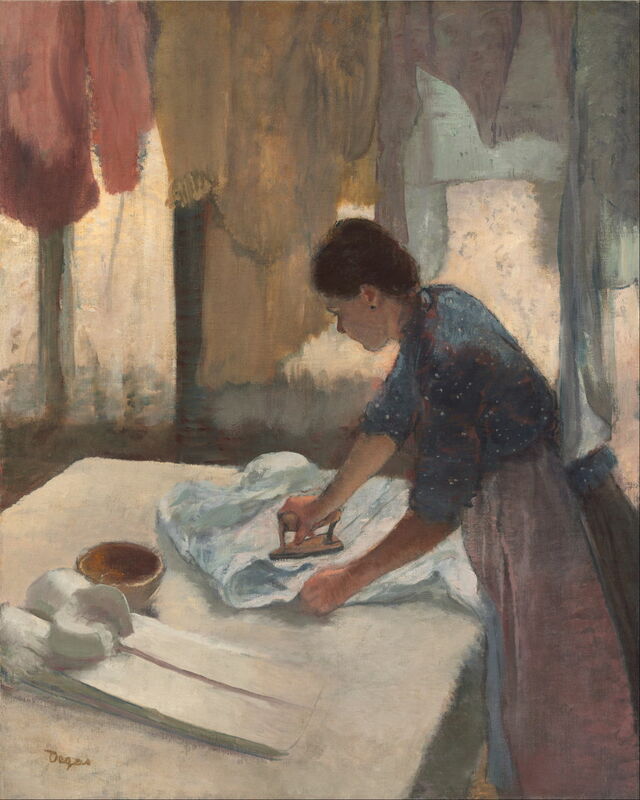 This less gloomy painting of a Woman Ironing (c 1876-87) maintains the impression of this being protracted, backbreaking work, only slightly relieved by the colourful garments hanging around the laundress. Edgar Degas (1834–1917), Intimacy (c 1877), monotype, 30.2 × 40.9 cm, Statens Museum for Kunst (Den Kongelige Malerisamling), Copenhagen, Denmark. Wikimedia Commons. From combing hair, Degas progressed to look at other aspects of the modern woman’s ‘toilet’. During the late 1870s, he devoted series of monotypes to such matters, of which Intimacy from about 1877 is an example. He appears to have been fascinated at the craft and care used to prepare a woman for public viewing – something a single man who had no known amorous relationships would find quite strange. Edgar Degas (1834–1917), Madame’s Birthday (1878-79), pastel over monotype on paper, dimensions not known, Musée Pablo Picasso, Paris. Image by Gautier Poupeau from Paris, France, via Wikimedia Commons. Degas also sketched extensively in some of the many brothels in Paris, producing at least one substantial series of monotypes, including this depiction of the girls in one celebrating their Madame’s Birthday (1878-79), which is overpainted using pastel. He inevitably pays attention to form, but seems also to have wanted to document these women in their working environment. Edgar Degas (1834–1917), The Millinery Shop (1879/86), oil on canvas, 100 x 110.7 cm, The Art Institute of Chicago, Chicago, IL. Wikimedia Commons. 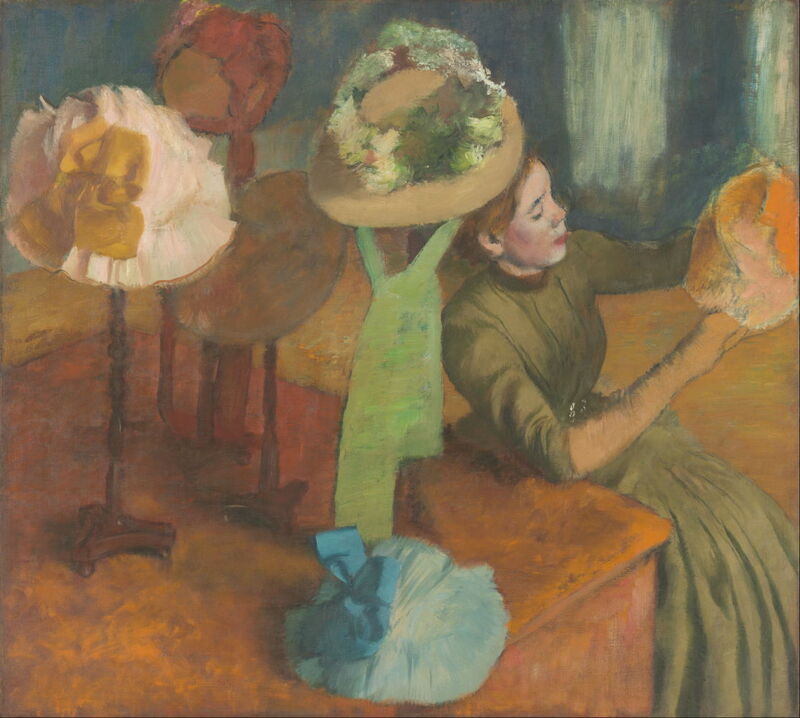 Slightly later, Degas looked carefully at one of the delights of the middle and upper class modern woman, the selection of hats in The Millinery Shop (1879/86). In these pastel and oil paintings, he experiments with unusual views and cropping, as he studies the process of assessing and choosing a hat. Hilaire-Germain-Edgar Degas (1834–1917), Danseuse dans sa loge (Dancer in her Dressing Room) (c 1879), pastel and peinture à l’essence on canvas, 37.7 x 87.9 cm, Cincinnati Art Museum, Cincinnati, OH. Wikimedia Commons. At the ballet, he followed the women and girls into their dressing rooms, and painted them there, as in Dancer in her Dressing Room (c 1879). For this work, he used the almost unique combination of peinture à l’essence and pastels. The former is essentially oil paint with most of its oil binder removed, then made more tractable by diluting it with petrol (gas) or turpentine, which results in very weakly-bonded paint layers. Coupled with pastel, which has no binder and relies on mechanical forces to keep it on the ground, this must now be a nightmare to conserve. Throughout his career, Degas seems to have found it difficult to paint with oils in any conventional way, and much preferred drawing with a brush charged with his favourite peinture à l’essence. At about the same time, in 1879, Degas embarked on one of his major works, again concerned entirely with one woman, the circus performer Miss La La (or Lala), who startled audiences by her aerial act, suspended only by her teeth. 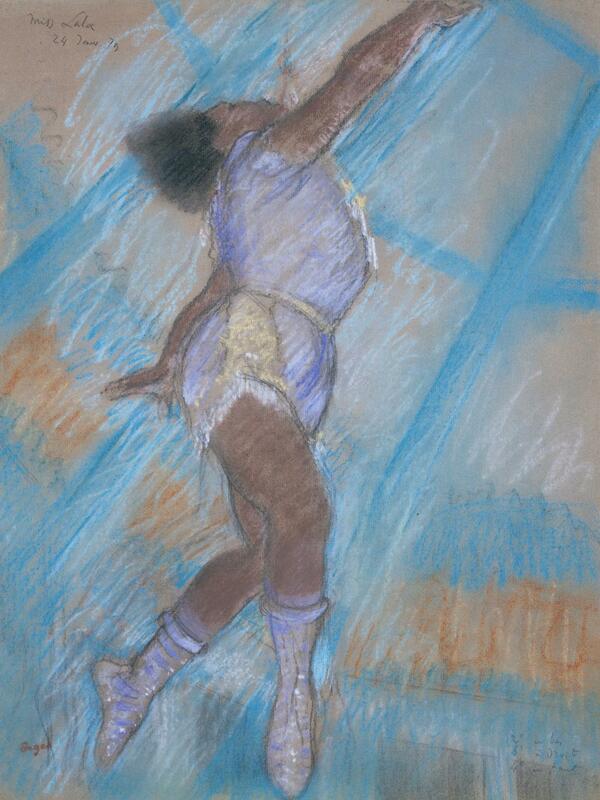 He started with a series of drawings, looking at different views and compositional possibilities. 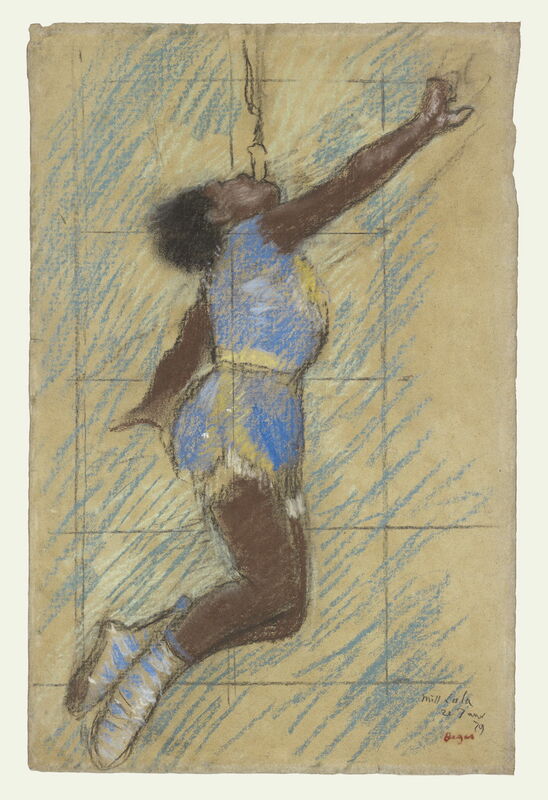 Edgar Degas (1834–1917), Miss Lala at the Fernando Circus (1879), pastel, 46.4 × 29.8 cm, The J. Paul Getty Museum, Los Angeles, CA. Courtesy of the J. Paul Getty Museum. He then refined those into what I believe was his first pastel sketch of Miss Lala at the Fernando Circus (1879), now in the Getty. He has squared it up with a pencil to make the image easier to transfer to his next study. 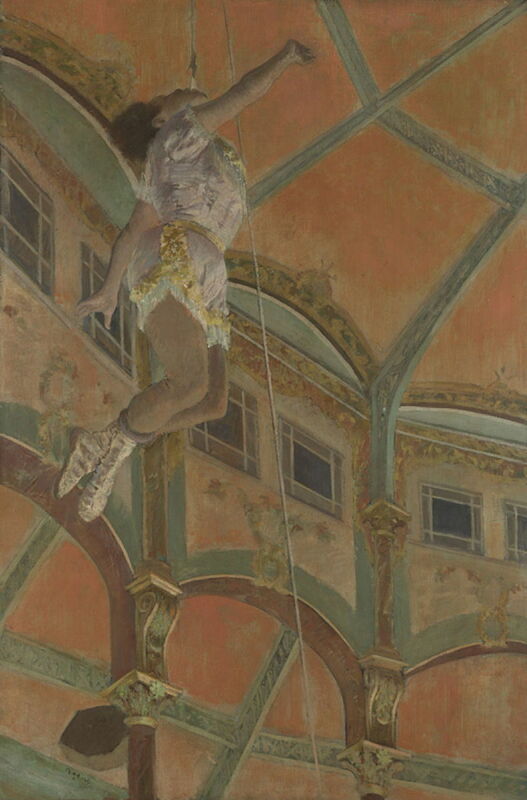 This later version of Miss Lala at the Cirque Fernando (1879), now in the Tate, makes small adjustments, such as bringing her right leg round more, as if her hips had been rotated, and adds some background. Edgar Degas (1834–1917), Miss La La at the Cirque Fernando (1879), oil on canvas, 117.2 x 77.5 cm, The National Gallery (Bought, Courtauld Fund, 1925), London. Image courtesy of and © The National Gallery. 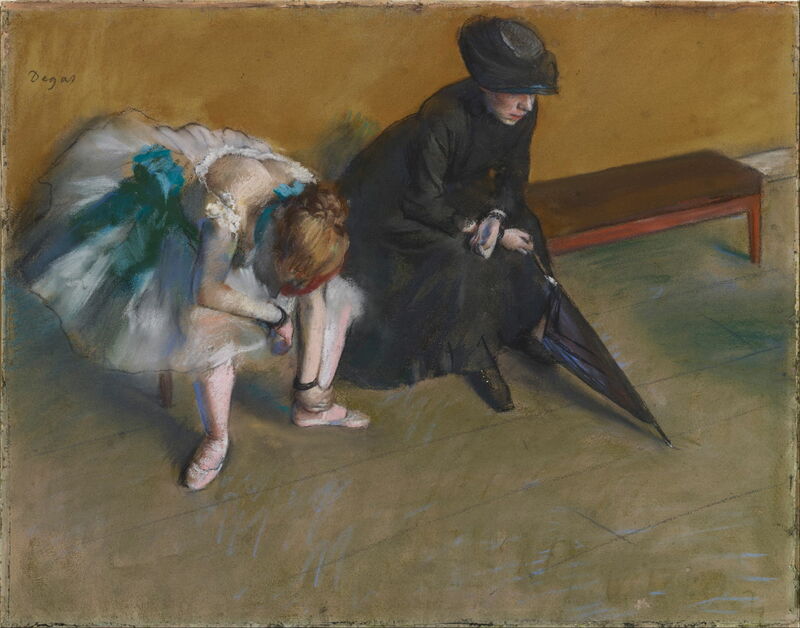 In the final version, Miss La La at the Cirque Fernando (1879), painted in oils and now in London’s National Gallery, Degas has changed his mind about her legs, rotated her hips the other way, and drawn her feet higher up behind her. Once again, Degas has pursued form throughout the development and completion of this painting, but its theme is surely a young woman whose skilled and hazardous performance amazes audiences each night. I have already considered the potential narrative aspects of Degas’ Waiting (c 1882). It draws a glaring visual contrast between two of the artist’s modern women: the dancer at the left, a consummate professional in her field, and the well-dressed woman next to her. Note how, as in Mary Cassatt’s portraits of women, Degas obscures their eyes here, to give them privacy and self-respect. Edgar Degas (1834–1917), Mademoiselle Bécat at the Café des Ambassadeurs (1885), pastel over lithograph, 23 x 20 cm, The Morgan Library & Museum, New York, NY. Wikimedia Commons. 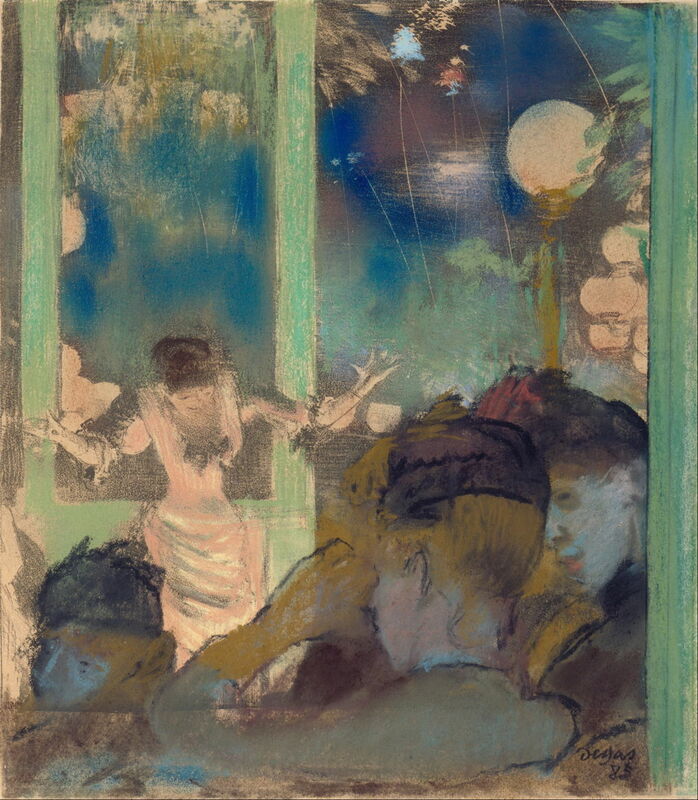 Another theme which inspired a series of works is the café entertainer, as with Degas’ pastel painting of Mademoiselle Bécat at the Café des Ambassadeurs from 1885. Like Miss La La, these singers are professional women, working hard in their careers. What is also noticeable is that most of their audience, as shown in this series, consists of other women. 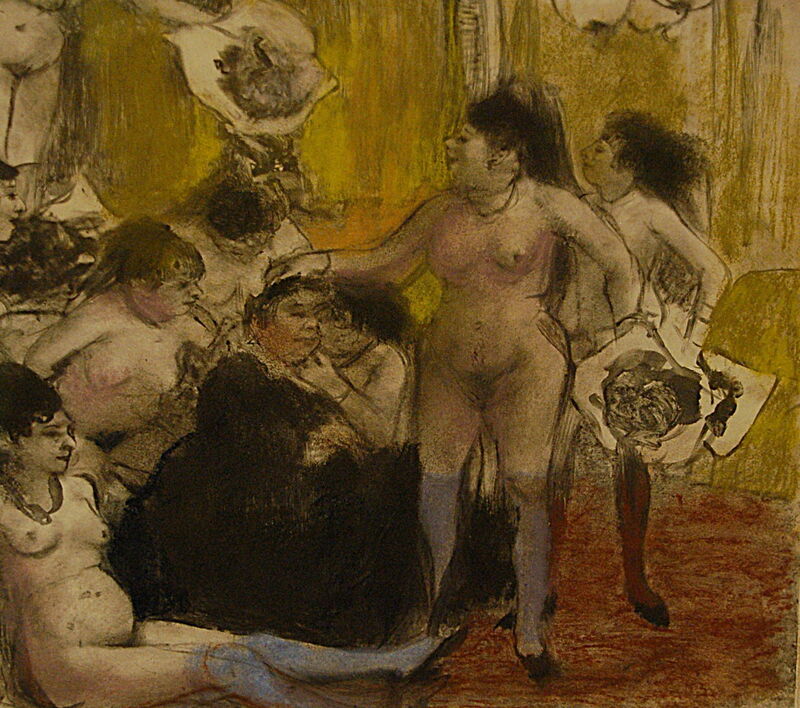 Although not perhaps enjoying the same upper-class cultural experience as Mary Cassatt’s theatre-goers, Degas too shows women out enjoying some leisure in the company of other women. 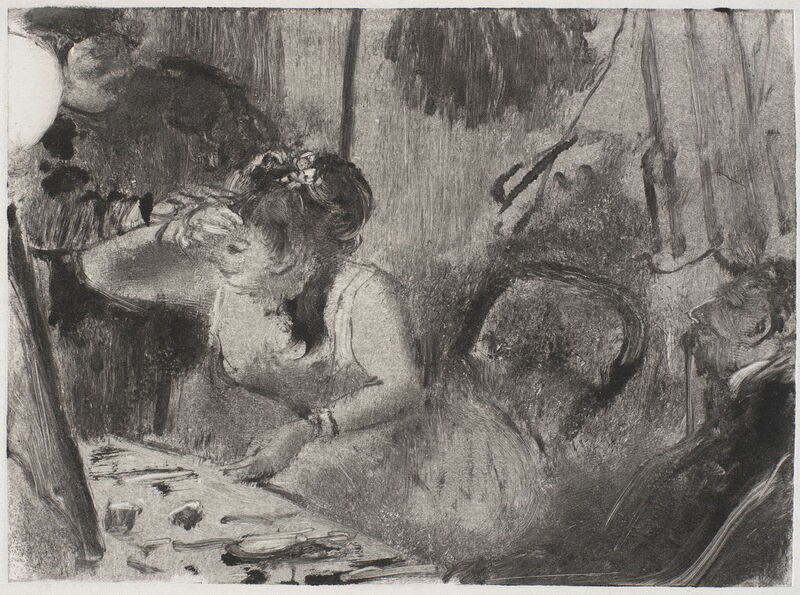 My final work selected from Degas’ depictions of the modern woman is his pastel In Front of the Mirror from 1889 – the same year in which Mary Cassatt seems to have started work on her related print of La Toilette, which also shows a woman preparing herself in front of a mirror, with her face carefully concealed. 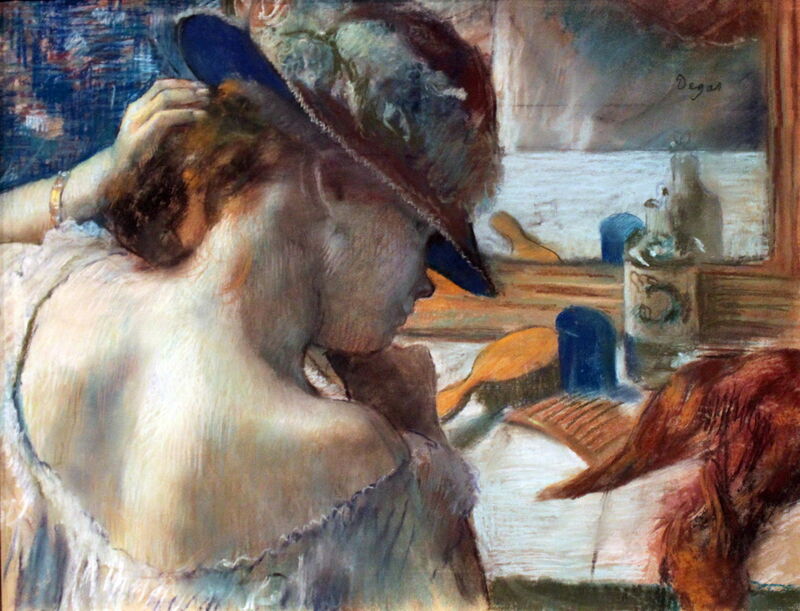 Degas’ model is not washing herself, but is carefully adjusting her hat and hair so that they look just right. This links in with his series of women bathing (which I will cover in my next article on his work), millinery, and the private and intimate life of the modern woman. Posted in General, Life, Painting and tagged Cassatt, Degas, figures, modern woman, painting, women. Bookmark the permalink.